First of all, allow me to explain why. Our home is slowly turning into a white neutral haven with french farmhouse detail. 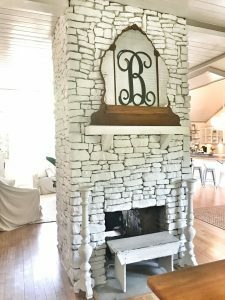 The stone fireplace was beautiful but no longer blended within the style of our home.🙄 So, we decided to paint it! I went with the same color as White Dove by Benjamin Moore but I had it mixed at Home Depot for convenience. (Tip – Home Depot has a formula for every Benjamin Moore color) 😌 White Dove is the color of our shiplap so I knew it would work. 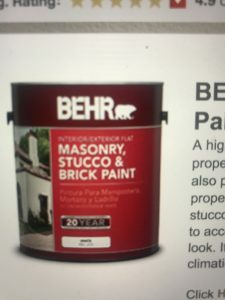 Behr Masonry, Stucco and Brick Paint in a flat finish is what we used. One gallon can was around $20 🤑 and completely finished our large double sided fireplace. Also, this would be the time to tape plastic over anything you don’t want painted. I love it. It’s beautiful and I love the neutrals. ❤ Love and Hugs! Thank you!!!! I’m so glad you checked my blog out!! 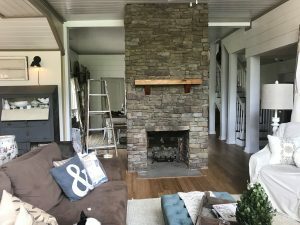 We have thought about painting our brick fireplace. Our brick is made to look old and has some paint-like stuff on it in places. 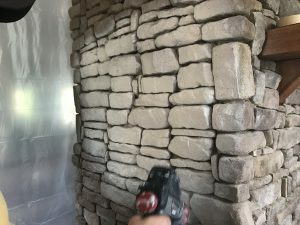 Should we wire-brush it first?